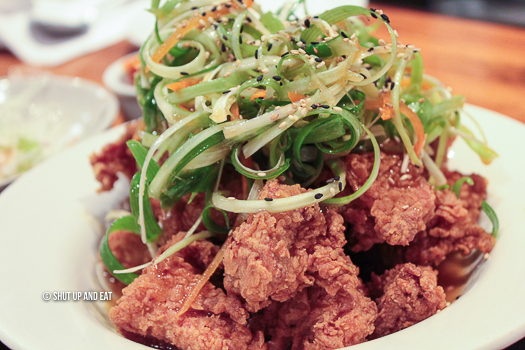 Crunchy Korean Chicken in the Plateau - Restaurant Hoya - Shut up and eat. 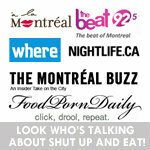 The Plateau is undoubtedly one of the city’s most colorful neighborhoods. 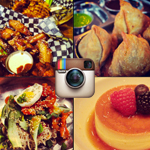 Vintage shops, cute cafes, and restaurants specializing in any kind of cuisine you can image… except for Korean. For the longest time, the Plateau had no love for bi bim bap, pajeon or japchae. Why? Who knows. But recently, a little spot called Hoya on Mont Royal and the corner of Henri-Julien just helped the Plateau diversify its eatery options and turning up the gochujang heat while doing so. gochujang heat while doing so. 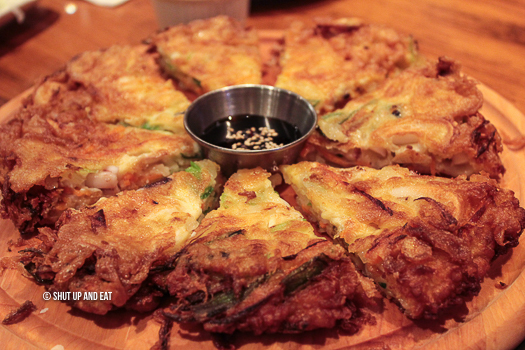 We started with the haemul pajeon. Fluffy slices of pancake stuffed modestly with pieces of octopus, squid, shrimp, shredded scallions and carrots. It was thick and substantial, one of the better seafood pancakes I’ve had in a while. 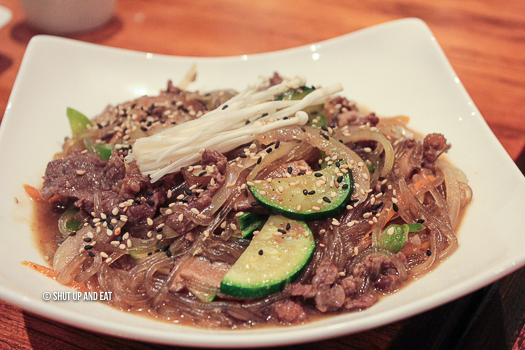 The japchae – stir fried sweet potato starch noodles with beef, and vegetables. Sweet and savory, the noodles were comforting and chewy. Portion was modest. I think it would have fed two people easily, three, maybe. We were six. 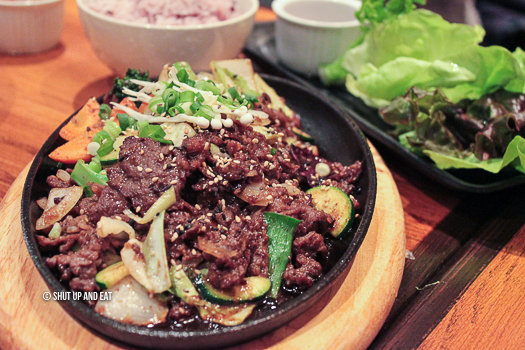 We also ordered the beef bulgogi Deopbab – beef and vegetable stirfry, served with rice and salad. The beef was nice and smokey. Vegetables were undercooked for the most part and the five leaves of Boston lettuce provided a nice crisp vessel to wrap the stir fry in. The Robokki was good. 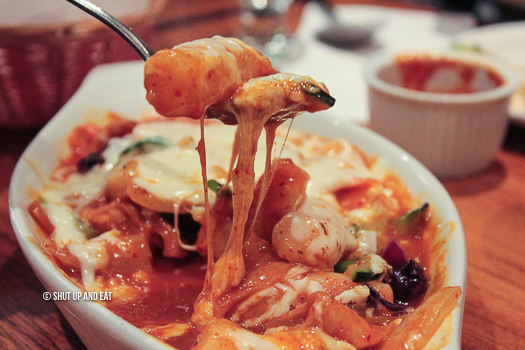 Stewed rice cake and fish cakes with vegetables covered with cheese and gratinéed. The rice cake sticks were soft and deliciously chewy. The red sauce was sweet with a touch of heat, but nothing the creamy cheese couldn’t extinguish. 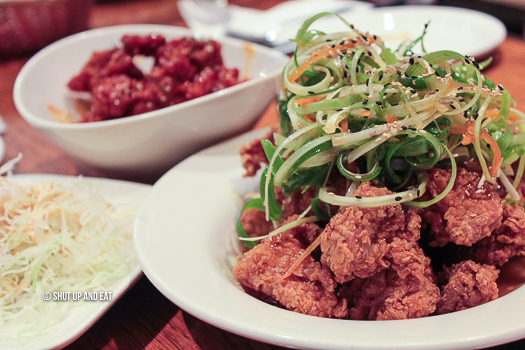 Hoya offers three types of Korean fried chicken. We ordered all three. 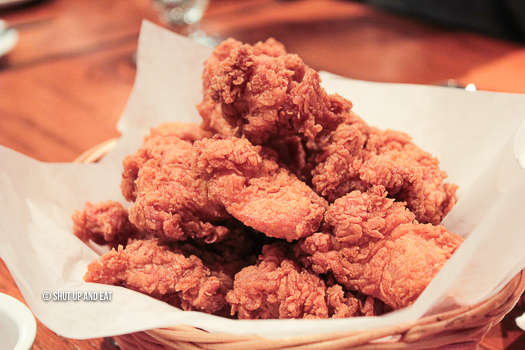 The sunsal chicken was a basket of boneless chicken pieces, lightly battered and fried to a golden crisp. The chicken was juicy and tender and extremely hot. I never learn my lesson, hot fried things are like a magnet for my mouth. Not much inherent flavor unfortunately. 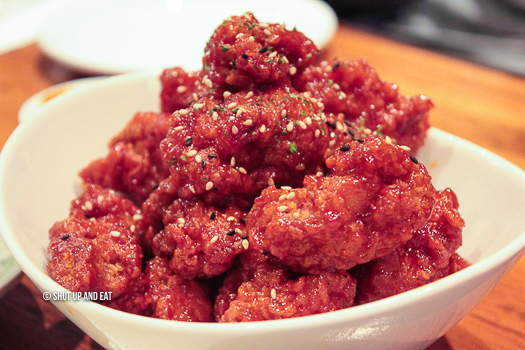 The Dakgangjung is is the same chicken doused in a sweet chili sauce. Not very sweet, and not very spicy. Very so-so. The Padak chicken was probably my favourite of the three. Fried chicken in a syrupy sweet soy sauce garnished with shredded scallions and carrots. The sauce was sweet when eaten with the chicken and was balanced with the sharp scallions that added a great element of freshness in each bite. The menu at Hoya consists of traditional Korean dishes. 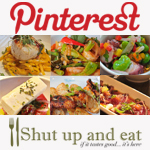 Soups and stir-fry, noodles and dumplings that don’t venture too far from classic popular dishes. 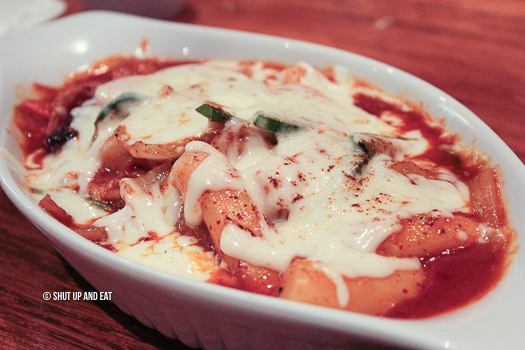 Hoya is a great addition to the neighborhood that has been desperate for some Korean love. It’s not the best I’ve ever had, but I would consider stopping by if I were in the area and was jonesing for Korean fried chicken. 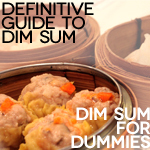 I’d say it’s more geared towards people who may be slowly easing themselves into the Korean culinary world or venturing out of their comfort zones to try something “new”.